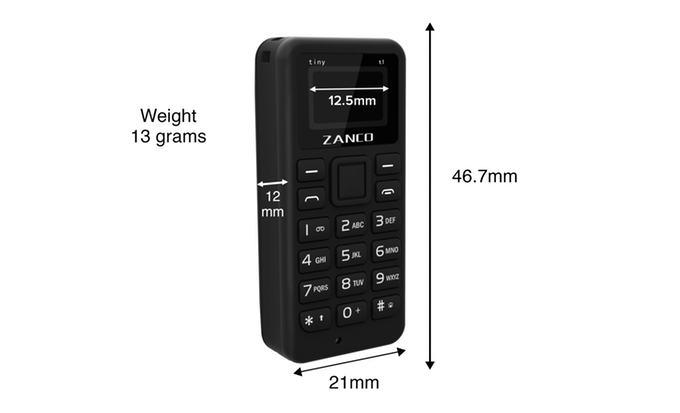 Yes, you heard it right, Zanco tiny t1 is the world’s smallest mobile phone. For a very long time, phone makers have been experimenting with the size and shape of mobile device ranging from Flip phones to phablets with 6+ inches of screen. And just when we thought we have seen it all, a UK based company has surprised us again. 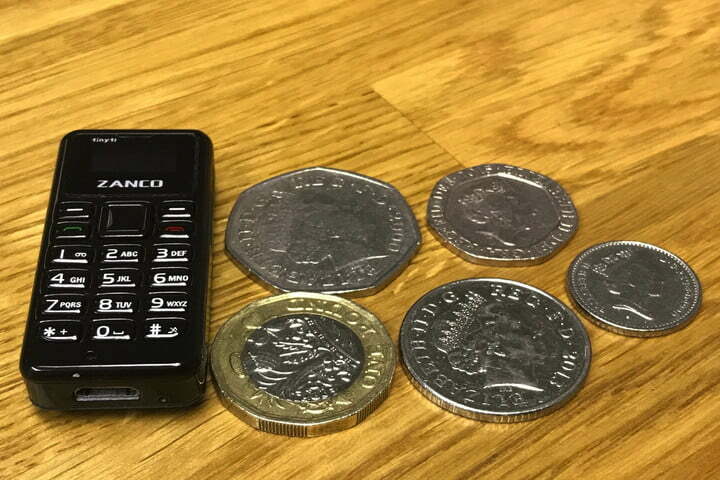 Zanco tiny t1 claimed to be the smallest phone in the world has been launched by Clubit New Media as part of a Kickstarter campaign which as of now has reached USD $49,394. Tiny t1 measures 46.7 mm x 21 mm x 12 mm and has a weight of 13 grams. The phone has the tagline “Talk and Text mobile phone” and it’s smaller than the size of your thumb but doesn’t do much except for making calls and sending a text. Zanco tiny t1 is priced at EUR 30 (USD $35) and supports a single nano-SIM. With its 32 MB of storage, it can store up to 300 contacts, 50 SMS messages and the last 50 outgoing/incoming numbers in the call log. Zanco tiny t1 is powered by a MediaTek MTK6261D motherboard along with 32 MB of RAM. It has a 0.49 inch OLED display with 32 x 64 pixel resolution and all of that is being plastered on a 200 mAh battery which makes it last for 3 days on standby and provides 180 minutes of talk time. In terms of connectivity, it supports 2G network, a microUSB card and Bluetooth. Tiny t1 is packed with a backlit T9 keypad along with a mic and loudspeaker at the bottom. The company markets the device as a backup phone which would be great for cyclists, joggers, walkers and basically anyone who engages in sporting activities. With no 3G/4G availability or any multimedia support like gaming, music or movies, it hardly qualifies as a phone for the new generation. Zanco tiny t1 is a great and at the same time a bizarre achievement of technology. With a very limited use in today’s technology-dependent world, it can only be a good conversation material. Anyway if you find an offbeat use for this tiny device, do let us know in the comments and share this news with your friends and family and tell them about Zanco tiny t1.